Beauty Industry of the Republic of the Union of Myanmar continue to grow steadily with an average annual growth rate of 14 percent, representing a total market value of over 318 million US dollars, or about 11,100 million baht. Meanwhile the advertising budgets in the industry beauty increases by 77 percent per year. The section with the highest growth is hair product group at up to 97.5 percent followed by facial skin care group at 70.25 per cent, while the body care group is at 63 percent. Minh Vi Exhibition & Advertisement Services Co., Ltd, (VEAS Co., Ltd) in conjunction with Myanmar Hair Professionals Association (MHPA) will host the MYANMAR BEAUTY CONNECT EXPO 2016, the trade show and exhibition in beauty between 20-22 May 2016 at the Rose Garden Hotel in Yangon, Myanmar in order to provide a platform for trade negotiations and the beauty industry discussion for entrepreneurs who want to expand their business to Myanmar. Bangkok – Friday, 19 February 2016 – Ms. Daw Nan Ei Ei Zar, president of Myanmar Hair Professionals Association; Mr. Romain Marseli, Business Development Director of Minh Vi Exhibition & Advertisement Services Co., Ltd; and Dr. Surachai Liamthong Ph. 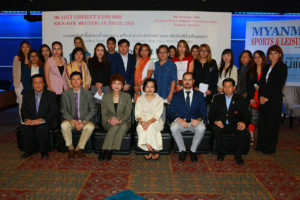 D., President of Vita Stem International, Inc. U.S.A (Thailand) participated in the press conference announcing the MYANMAR BEAUTY CONNECT EXPO 2016 with over 40 leading operators from Thailand. This is a golden opportunity for investors, both Thai and international in the beauty industry of Myanmar. Apart from the MYANMAR BEAUTY CONNECT EXPO 2016 which will be held from 20-22 May 2016 (09:00 to 17:00) at the Rose Garden Hotel (Yangon, Myanmar) is also planning to organize this event in two more countries whose beauty industries have substantially grown. The first country is Cambodia where the event will be held from 4-5 September 2016 at The Diamond Island Convention & Exhibition Center in Phnom Penh. The second country is Bangladesh where the event will be held from 18-19 October 2016 at the Pan Pacific Hotel Sonargaon in Dhaka. For those who are interested in joining the exhibition in the BEAUTY CONNECT EXPO 2016 in Myanmar, Cambodia, and Bangladesh, please contact us at (+84-8) 3842 7755 or email us at info@veas.com.vn or visit our website http://www.beautyconnectasia.com for more information.